Goals from Peter Whittingham and Roger Johnson helped Championship side Cardiff dump Middlesbrough out of the FA Cup at the quarter-final stage. Premier League strugglers Boro were poor throughout and went behind on nine minutes when Whittingham curled home. And 13 minutes later Roger Johnson headed in Whittingham's free-kick to leave Boro with a huge uphill task. Afonso Alves and Stewart Downing both had half-chances for the home side, but they rarely threatened a comeback. Boro had made a steady opening to the match but were left furious by the Bluebirds' opening goal. Stephen McPhail appeared to handle in mid-air before it fell to Whittingham. But nothing was given and the former Aston Villa player latched on to the ball inside the box and curled it into the top right-hand corner after finding space with some brilliant skills. That lead was doubled on 22 minutes after Jimmy-Floyd Hasselbaink was fouled 30 yards out by Fabio Rochemback. 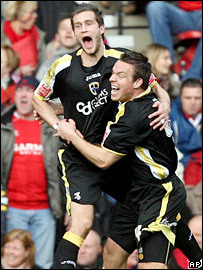 Whittingham's resulting free-kick found Johnson free at the back post - and he headed the ball back across goal and into the net past Mark Schwarzer. Johnson came close to replicating his goal from the opposite side soon after, while Paul Parry drilled an effort just wide as Cardiff controlled the game. Middlesbrough were finding themselves outfought and outplayed in the first half and were restricted to just the one half-chance. That came from Alves, who cut inside from the left and curled a shot that Peter Enckelman was able to parry to safety. The home side were deservedly booed off at the break and came out for the second half looking to claw themselves back into the game. But Cardiff coped with everything they threw at them. Downing saw one effort go just wide on the hour after Hasselbaink gave away a free-kick just outside the box for handball. But Boro lacked ideas, much to the frustration of the home supporters, some of whom decided they had seen enough with 20 minutes still to go. And they missed nothing as Cardiff held on to continue an extraordinary weekend of shocks in the FA Cup and book their place in the Wembley semi-finals. Middlesbrough: Schwarzer, Young, Wheater, Huth, Pogatetz, O'Neil (Johnson 59), Arca, Rochemback, Downing, Alves (Mido 46), Sanli. Cardiff: Enckelman, McNaughton (Blake 87), Johnson, Loovens, Capaldi, Whittingham, Rae, McPhail, Parry (Sinclair 82), Ramsey, Hasselbaink (Thompson 76). Goals: Whittingham 9, Johnson 23. BBC Sport Player Rater man of the match: Cardiff's Peter Whittingham 8.28 (on 90 minutes).